Scott Swann is one of three young Northern Ireland riders selected for the 2018 British Talent Cup. Three budding young racers from Northern Ireland have been selected for the elite new British Talent Cup series for 2018. Scott Swann (14), Sam Laffins (15) and Jonny Campbell (14) will join a total of 22 riders in the programme, which has been put in place by MotoGP promoters Dorna with the aim of nurturing new talent. 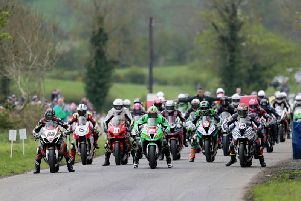 Rounds are expected to take place at international circuits on the MCE British Superbike Championship calendar and also at selected MotoGP and World Superbike events. Teenager Rhys Irwin from Donegal also made it through as around 90 hopefuls aged between 12 and 16 participated in the selection process at Silverstone on Wednesday. Former Grand Prix star Jeremy McWilliams was among the judges along with Alberto Puig and Shuhei Nakamoto – the former Honda Racing boss. McWilliams said: “It’s been a hectic day and it’s stressful for us and the kids. The kids ride on the limit to impress but it’s a process that brings out the best, as we found out today. “It’s the start of an incredible journey for the riders who have been selected and maybe even for some of the reserve riders. We would love to fit more in but we’re limited on space.